Pink Lemonade: Ready for an Outdoor Tiki Bar? Ready for an Outdoor Tiki Bar? 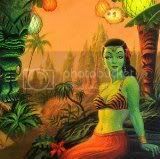 The Tiki subculture of the 21st century is a revival of the Polynesian craze of the 1950's and 1960's: lounge music and fashion, exotic drinks, swaying palm trees, exotic women and south pacific island dreams. When you say "drinks with the little umbrella," you are talking from the roots of Tiki. 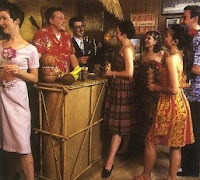 The Polynesian pop culture of the 1950's through the beginning of the 1970's really began much earlier. Early explorations and tales of beautiful women, who had a penchant for free love, were some of the earliest stirrings of civilized culture's imaginations. In reality, Captain Cook was mistaken for a God when he arrived in Hawaii during a celebration; thus he was given the royal treatment. The Island people were a sharing and generous sort, but probably feared more for their welfare. Melville's writings and Gaugin's paintings of Tahiti and the South Pacific led further to the mystique of island life. In 1932, Victor Bergeron opened his first restaurant, Hinky Dink's in Oakland, California. He served his version of a mix of "Chinese, Japanese, or Tahitian dishes", and tropical cocktails. About Rum he said, "I was peddling rum long before the present liquor shortage because I like rum. I like the drinks it makes and everything about it." The place quickly became popular, with help of the writings of Lucious Beebe. He changed his name and the establishment's to Trader Vic's in 1936. He had a peg leg and though he had lost it from Polio as a child, the stories and a legend began. Prohibition ended in 1933, but America was still in the throes of the Depression. Rum was by far the least expensive of spirits to stock. One enterprising new Hollywood proprietor, Ernest Beaumont-Gantt opened Don the Beachcomber in 1934. He was from New Orleans and had been to Jamaica with his father. He mixed potent Rum cocktails in his tropically decorated bar. This was such an escape from everyday life that it rose quickly in popularity. The Island ways gained popularity after WWII with the soldiers returning from the South Pacific. James Mitchner romanticized the appeal even more with his South Pacific novels. The play and eventual movie, South Pacific, along with Rogers & Hammerstein's "Bali Hai" just fed more fuel to the Tiki mystique. Then in 1947, archeologist and explorer Thor Heyerdahl made his famous expedition on a balsa wood raft, the Kon-Tiki, from Callio, Peru. It took him 101 days and 4300 miles to reach Polynesia. This proved his theory that it was possible that exiled Peruvians could have drifted and inhabited the islands. Though not a hit in his native Norway, the Americans loved the story and the ensuing documentary won an Oscar in 1951. Tiki artwork, sculptures, and the totem-pole style carvings are from all over the Pacific and Pacific Rim - island nations, native cultures, and rare tribes express their connection with magic, gods, and forces of nature. You'll see different styles of Tiki art and sculpture, depending on it's origin. Hawaii, our USA state in the south pacific have an abundance of cultural items such as Hawaiian shirts, grass skirts and bamboo architecture which are all classic and reminiscent of stylish Tiki culture. Tiki Bar -- Tiki bars come with a variety of amenities and accents that can include, thatch roofing, bamboo paneling, decorative wood carvings, umbrella-style roofing, a flat roof style, or even some with no roofs. Custom-made, pre-assembled, and portable bars are also available. Tiki Planter with Clay Pot Insert -- Each planter is constructed of eco-friendly coconut palm trees, kiln dried and then finished with a high quality marine varnish and is suitable for indoor or outdoor use. Natural Rolled Bamboo Fencing -- Connected with hidden heavy gauge galvanized wires, our fence panels are pre assembled and ready to be installed in your outdoor garden or home. Easily set up outdoor structural fences by connecting them together to form a screening barrier. Thatch and Umbrella Kits -- Thatch roofing is one of the oldest forms of roofing known. Thatch is renewable, fast growing and earth-friendly. BambooandTikis.com carries coco palm thatch roof panels from Mexico (also known as palapas), cape reed panels from Africa, and thatch panels from Fiji. 100% organic Moso Bamboo Rugs -- Extremely durable and beautiful, these rugs can be used on all types of surfaces including hardwood, carpet, tile and cement floors. From their 65,000 square foot facility in San Diego, CA, Bamboo and Tikis is one of the largest providers of outdoor and backyard related products in the western United States. All employees are committed to the endless hours needed to make their business expand and prosper. Bamboo and Tikis flies around the world sourcing products directly from the manufacturer so the customer gets the best quality and pricing.